When Montana Sertz was offered the opportunity to direct a play for Edinboro University’s Diebold Center for the Performing Arts, she immediately thought of the 1940s film adaptation of “Arsenic and Old Lace,” which she considers the best Cary Grant film ever made. In looking to portray the tireless humor of the film, she and assistant director Richard Kolbosky brought the story to life last weekend in Diebold. Set in the throes of World War II, “Arsenic and Old Lace” follows a day and night in the Brewster House, located in Brooklyn. 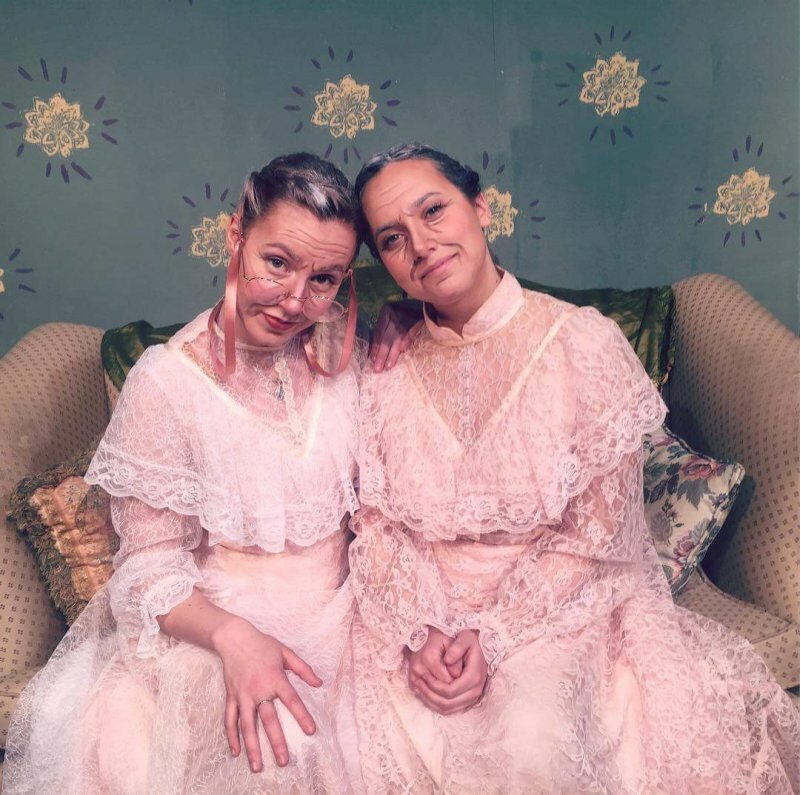 The house is occupied by two elderly sisters by the names of Abby Brewster, played by Mary Kate Noonan, and Martha Brewster, played by Julia Kramer, their nephews, and various friends of the family. Witty banter that playfully reflects the conservative climate of the early 1900s reveals the odd nature of the Brewsters, while the plot takes an abrupt and hilarious turn early in the show, never stopping the comedy, romance and surprises. The audience laughed abundantly through each act as the cast worked in tandem. Sertz, who has worked on past productions with Noonan and Kramer, knew “the chemistry was already there” when she cast them as the matronly, pious, charitable Brewster Sisters. Their nephews — Mortimer (a theater critic), Teddy (a lovable gentleman of questionable sanity) and Jonathan (who returns from a long estrangement) — are played by Lukas Gerlach, Dewey Hudacky and Zach Goughler, respectively. All tap into the chemistry between Kramer and Noonan on the way to stellar performances. Supporting cast members include Amelia Tatone as Elaine Harper, Mortimer’s fiancé; Shannon Eyres as Dr. Einstein, a plastic surgeon; Mikhail Ferree as both Officer O’Hara and Elaine’s father, the Rev. Dr. Harper; Jason Hurst and Taylor Aniela as officers Brophy and Klein; Eric Reiche as Lieutenant Rooney and as a passerby named Mr. Gibbs; and Kelli Prizner as Mrs. Witherspoon, the superintendent of the local mental hospital. The set was created in the week before the show. According to Sertz, the cast put 40 hours into creating the sets and hand-painting the wallpaper of the Brewster’s home twice. She pointed to the empty sets after the show and gushed about how most of the furniture and props were donated by the cast members. Kramer and Noonan agreed that “everyone was wonderful to work with” and that cast members have become close throughout the production process. To get into her elderly character, Kramer explained that she “mixed the voice of Linda from ‘Bob’s Burgers’ with a stereotypical old lady’s voice.” Noonan listened to a voicemail left for a friend by the friend’s grandmother. The cast received their scripts a few months ago, except Goughler, who joined the cast a few weeks before opening night — a fact his performance didn’t reflect. Ripe with dramatic irony and murderous fun, “Arsenic and Old Lace” brings a classic tale of family, humor and madness to the Edinboro University campus. The play will have 7:30 p.m. showings on March 1-3, as well as a Sunday matinee at 2:30 p.m. on Mar. 4. Tickets are priced at $10 for general admission, $5 for EU faculty, seniors and children and $3 for EU students. Zeila Hobson can be reached at ae.spectator@gmail.com.